Update 8/31/18: Added Year's Best Dark Fantasy & Horror: 2018. Update 8/23/18: Added Best American Science Fiction & Fantasy 2018. Update 4/17/18: Tagged Sturgeon Award finalists. Update 3/2/18: Added links to 3 Analog stories from 2017 AnLab Readers Awards finalists. Update 2/23/18: Added links to 3 Asimov's stories from 2017 Asimov's Readers Awards finalists. Update 2/15/18: Added 14 stories that were missed. Here are 141 stories (71 free online, click to highlight) from six of the "year's best" SF/F anthologies for 2017, sorted by score to highlight the stories that made it into the most anthologies, finalists for the most awards, and were most recommended by prolific reviewers. Other factors that increase a story's score include honorable mentions from Locus Magazine reviewers Gardner Dozois (GDozois+1) and Rich Horton (RHorton+1), Best American Science Fiction & Fantasy (BASFF+1), and "year's best" and honorable mentions from prolific short fiction reviewers Greg Hullender at Rocket Stack Rank (RSR+2, RSR+1), Sam Tomaino at SFRevu (SFRevu+2, SFRevu+1), and Jason McGregor at Featured Futures (JMcGregor+2, JMcGregor+1), all of whom reviewed 500+ SF/F stories for their magazines/blogs in 2017. You're missing 14 stories that are included in the Year's Bests, and you have one here that isn't in any of them. Oops! Thanks for double-checking. The extra story was due to a copy/paste error, the missing stories for NClarke and GDozois were due to forgetting to flag stories with BestSFF2017 when they didn't overlap with another "year's best". The flagging process is manual and prone to mistakes, so I'll automate it next year. Thanks. I've added the link to the spreadsheet and it'll show up in the the RSR Hugo and Locus tables the next time they're refreshed. Nitpick: 3 links to Analog stories added. Unless one of them was already online? Nexus, Focus, and Time Travel Is Only for the Poor. 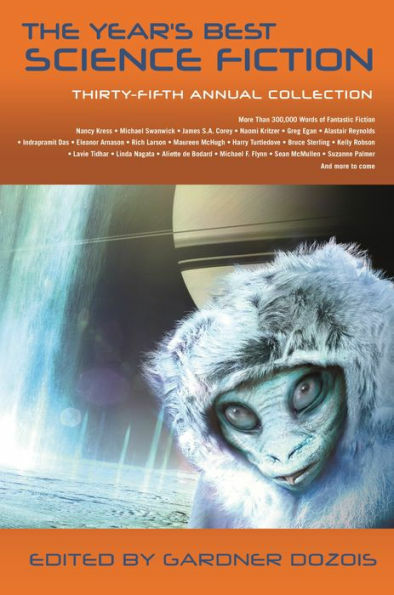 You didn't review this since it was published as a stand-alone novella by Innsmouth Free Press, but I thought Silvia Moreno-Garcia's Prime Meridian was terrific. I wouldn't have known about it either if Dozois hadn't picked it for his (sadly final) Year's Best SF; for me it was the highlight of that anthology. It doesn't have a whole lot of speculative content, aside from the existence of a well-established Mars colony that the protagonist dreams of joining, and a barely-extrapolated milieu of people (including the protagonist and her friends) struggling to survive in the worthless gig economy, but it's a superb work of fiction. I bought a copy of the print edition. Pity it's a 2017 story (and that time is so short). Feel free to let me know about any great stories outside my usual venues up until Hugo Nominations close. I can't guarantee I'll read and review them, but I'll certainly look at them. I believe it was only available to Indiegogo backers in Dec 2017. It wasn't released to the general public until July 2018. So make of that what you will. Now that is a pity. I guess that's no different from a story that you can't read without a subscription to a magazine, but still. I'd say it's more like a story shared on Patreon, then published to a wider audience. Doesn't sharing on Patreon count as publication for the purpose of awards like the Hugos though? I would assume so ... bit of an edge case but probably would have needed approval at the Business Meeting. I thought you had reviewed something like that, but it may have been one you didn't realize was previously on Patreon at first. Dozois certainly considered it a 2017 story (no idea if he backed it on Indiegogo - he must have seen it before its July 2018 general release date), but that's not a definitive answer as far as awards are concerned. Moreno-Garcia thinks it counts as a 2017 publication, according to her blog. It's copyright date is 2017, and that's typically what they go by. I think if it had been brought to the WSFS Business Meeting an exception could have been made for 2019 Hugo eligibility based on the 2018 wide release date. But it wasn't so probably not. Who knows what other awards might do. Yeah, the most extreme example of that is the Extrasolar anthology, which was published in the UK in 2017 and which sent ARCs to many US reviewers, but which didn't actually get published in the US until 2018. So many of those stories appeared in the 2017 Year's Best anthologies but they're actually eligible for the 2019 Hugo Awards in Dublin. What a mess!